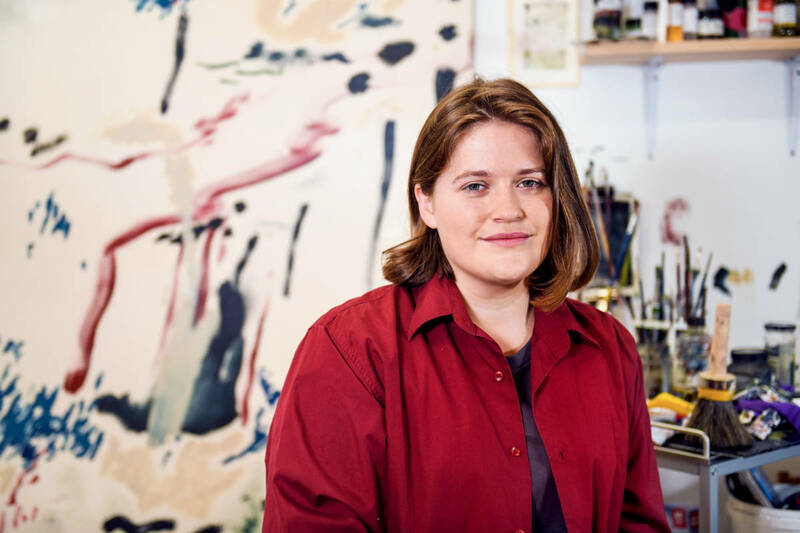 Painter Georgie North values strong relationships with her peers and enjoys working in collaborative and public art projects. She speaks with Kelly Southworth about empathy, inspiration, and learning from others. My understanding of art has become more empathetic since starting at the Victorian College of the Arts. Despite differences in approach and practice, there seems to be a common understanding and rapport between artists. I’ll never forget sitting in my studio towards the end of my third year in the undergraduate program with one of my lecturers. I was troubled with the work I was doing, mainly due to feeling pressure to articulate what it was about. He said: “It’s not what it’s about, it’s about what it does.” That shift in perspective has given me tremendous faith. I’ve found many opportunities to collaborate with other artists, and have been involved in a number of group projects, including the collective WNTR, and also a mural project with Megan Kennedy for PRIDE 2017 at the University of Melbourne. What I can learn from others, and how I can apply this knowledge, has become so exciting and valuable to me – to the point where learning and teaching have become the same process. I respond to art that doesn’t really follow a particular line of thought or application, but that affects me in a very particular way. Other times, I may see a work and feel very little, which isn’t to say it isn’t successful. Art shouldn’t have to perform or function in a particular way – that’s its beauty. After high school I took a year off from studying and worked full time in my hometown, Beechworth, while also working towards a solo show at the Wangaratta Art Gallery. 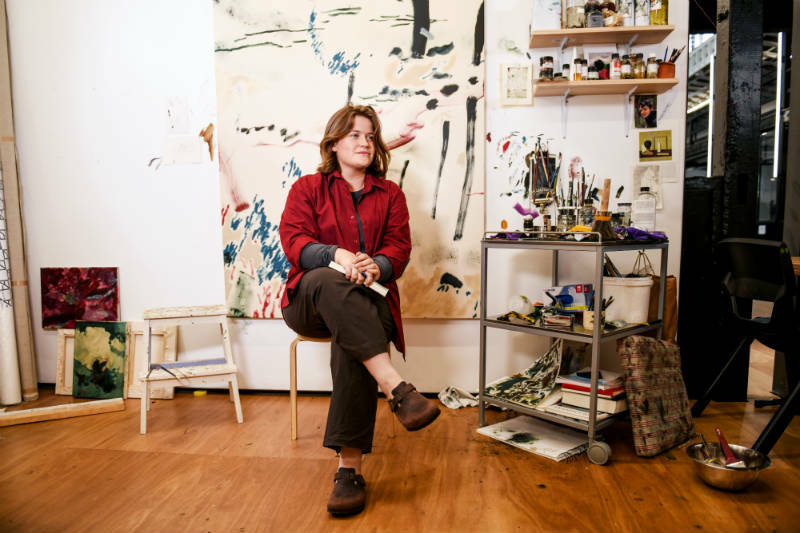 I had deferred an offer at The University of Melbourne in an Arts degree, knowing very well there was no other option for me other than studying at the VCA. I went to an Open Day the year before I started, and instantly felt like I belonged. I get in early each morning, and the first thing I do is look at what I’d been working on the day before. Once everyone else arrives, I join them for coffee – the most important meeting of the day. Painting, for me, often happens in bursts, and even if I’m painting all day I consider it an extended period of bursts. I’m always walking and moving around. I enjoy the intensity of the relationships formed in the university setting, and how they travel to everyday life. My peers are very important to me. I also enjoy the routine of study. Studying at the VCA has taught me the importance of chasing things for the right reasons: pursue your work with rigour and intent, and stay true to what interests you. Although I don’t think anyone ever truly settles, for my Honours year it’s truly rewarding for my work to foster certain conversations and avoid others. Some of the most profound forms of feedback and encouragement may be the words “just keep going”. The tremendous faith my lecturers have in art constantly inspires me. Banner image: Georgie North. By Giulia McGauran.